Elizabeth Wilder Holmes married Frederick Haight. Daniel Davis married Abbie Augusta Wilder, daughter of Ivory Wilder and Louisa Wilson, in Aug 6, 1872. James A. Knowlton married Ella Gould Wilder, daughter of George Wilder and Sarah Gould Blackington, in Mar 14, 1877. Jay J. Smyth married Martha Taylor Brooks, daughter of Joshua Porter Brooks and Ellen Wilder, in Jun 27, 1877. Lucinda Houghton married Nahum Fairbank, son of John Fairbank and Relief Houghton, in Jun, 1781 Fairbanks: Jan. 1871. Abel Houghton and Rebecca Willard declared their intentions of marriage on Mar 19, 1778 Lancaster, Worcester Co., MA, USA; both of Lancaster. Duplicate MLM: but age at md would be 12. Rebeccah Houghton and Daniel Allen declared their intentions of marriage on Apr 20, 1772 Lancaster, Worcester Co., MA, USA. Rebeccah Houghton married Daniel Allen in Apr 25, 1772. Alice Houghton and Joseph House declared their intentions of marriage on Jan 11, 1769 Lancaster, Worcester Co., MA, USA. Alice Houghton married Joseph House in Jan 31, 1769 at Lancaster, Worcester Co., MA, USA. Alice Houghton married Mr. (?) Allen note that sister Rebecca married a Mr. Allen; only given by JWH, Houghton Report. Relief Houghton and Calvin Sawyer declared their intentions of marriage on Jun 28, 1783 Lancaster, Worcester Co., MA, USA. Relief Houghton married Calvin Sawyer, son of Amos Sawyer and Mary Rugg, in Jul 24, 1783 at Lancaster, Worcester Co., MA, USA, w/1. Zilpha Houghton and Luther Sawyer declared their intentions of marriage on Apr 8, 1785 Lancaster, Worcester Co., MA, USA. Zilpha Houghton married Luther Sawyer, son of Amos Sawyer and Mary Rugg, in Jun 16, 1785 at Lancaster, Worcester Co., MA, USA. Daniel Allen and Rebeccah Houghton declared their intentions of marriage on Apr 20, 1772 Lancaster, Worcester Co., MA, USA. Daniel Allen married Rebeccah Houghton, daughter of Trumpeter Abijah Houghton Sr and Alice Joslin, in Apr 25, 1772. Mr. (?) Allen married Alice Houghton, daughter of Trumpeter Abijah Houghton Sr and Alice Joslin, note that sister Rebecca married a Mr. Allen; only given by JWH, Houghton Report. Calvin Sawyer and Relief Houghton declared their intentions of marriage on Jun 28, 1783 Lancaster, Worcester Co., MA, USA. Calvin Sawyer married Relief Houghton, daughter of Trumpeter Abijah Houghton Sr and Alice Joslin, in Jul 24, 1783 at Lancaster, Worcester Co., MA, USA, w/1. Calvin Sawyer married Mary Britton in Sep 19, 1793. Luther Sawyer and Zilpha Houghton declared their intentions of marriage on Apr 8, 1785 Lancaster, Worcester Co., MA, USA. Luther Sawyer married Zilpha Houghton, daughter of Trumpeter Abijah Houghton Sr and Alice Joslin, in Jun 16, 1785 at Lancaster, Worcester Co., MA, USA. Nancy Bagnall and Sparhawk Houghton declared their intentions of marriage on May 9, 1794 Lancaster, Worcester Co., MA, USA. Nancy Bagnall married Sparhawk Houghton, son of Capt. Elijah Houghton and Mary Allen, in Jun 1, 1794 at Lancaster, Worcester Co., MA, USA. 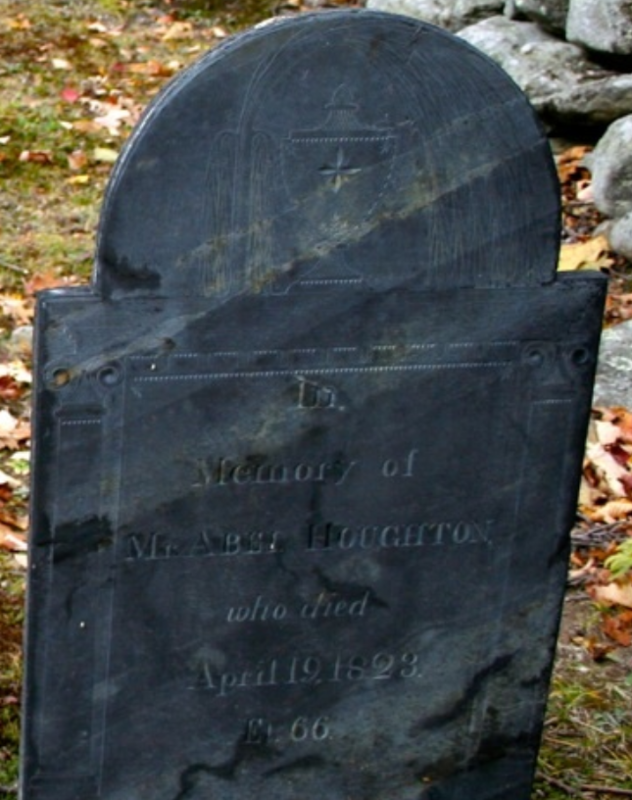 Sophia Houghton married Elijah Brigham in Apr 9, 1808 at Boston, Suffolk Co., MA, USA, Joslyn: 3/27/1803 (Int? ); MLM: int. May 27, 1816, Charlestown. Sophia Houghton and Jacob Robbins declared their intentions of marriage on Feb 14, 1778 Lancaster, Worcester Co., MA, USA. Sophia Houghton married Jacob Robbins in Mar 5, 1778 at Princeton, Worcester Co., MA, USA.